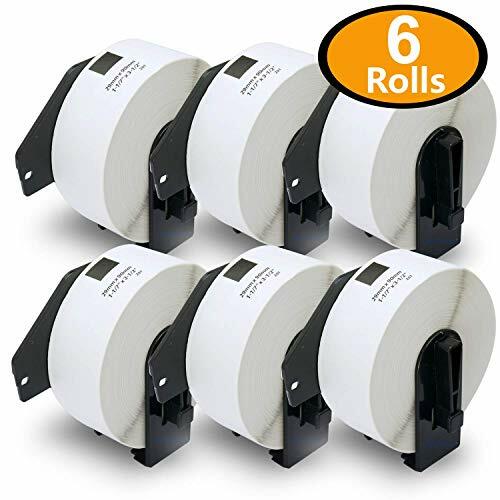 Replaces: DK1201, Dimensions: 29mm x 90mm, Colour: White, 400 Labels per Roll. It Can be used with all Brother QL printers (QL-500, QL-550, QL-570, QL-570VM, QL-580N, QL-650TD, QL-700, QL-710W, QL-720NW, QL-1050, QL-1050N, QL-1060N). Guarenteed to be 100% compatible and of the highest quality. It include Reusable/Refillable Cartridge,These reusable cartridges can be used over and over with as many rolls as you need. All Betckey products are BPA Free. BPA (bisphenol A) is an industrial chemical that has been used since the 1960s. Certain thermal paper may contain BPA. The National Toxicology Program at the Department of Health and Human Services says it has "some concern" about the possible health effects of BPA on the brain, behavior and prostate gland of fetuses, infants and children. Notice: We does not sell Brother-branded labels. "BROTHER", "P-Touch" and all other BROTHER-branded product names and SKU trademarks are trademarks of Brother International Corporation. Brother International Corporation does not sponsor or endorse any products made or sold by Betckey.